Love this cellphone case but case is too large for my phone so I have to return it. Been wanting this for a long time- was putting things behind phone and cases wouldn’ t fit right- love this❤️❤️ If they had it for a 5c I would get one for my sister!! This case works great. I can go places now without my purse and just slip my phone in the back pocket of my jeans freeing up my hands for antiquing. No more purse slipping off my shoulder or getting in the way when shopping. Love it! This is great case. Iwas truly expecting some disappointment in size or grip because I have the already large 6Plus. This case is very sleek, secure, super convevient, filled with great features and it is discreet and attractive. I couldn’t be more pleased. I am counting on this company to have one that will fit my new phone when I have to upgrade. I 1st bought the wrong size of this product but they exchanged it no question asked & it was almost a year later! 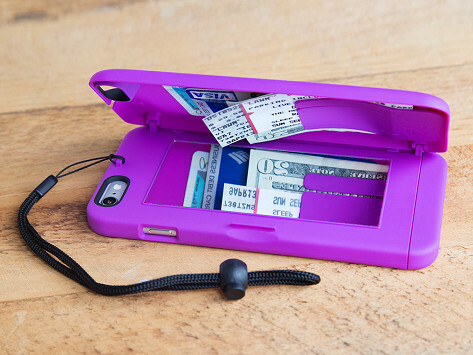 Bought this case last year b/c I frequently misplaced my ATM/credit card. Never happens now because I don't go anywhere without my phone and my cards are within! Went to Aruba and used as a purselet- perfect! I get many compliments and am frequently asked where I bought this. Thanks Grommet for cool useful products that make my life easier! Also- love the enclosed mirror for lip balm applications OR fishing things out of my eye. This little gadget is wonderful! I use it every day! Eliminates the need to lug around a purse all the time. Holds all I need in a tiny space. Love it, love it, love it!! Think I’ll get another as a backup and in another color. Well made and fits my phone perfectly. Don’t know how I got along without it. Durable and works well. Fits in a back pocket. No purse needed! Some days you just don’t feel like lugging a big purse. 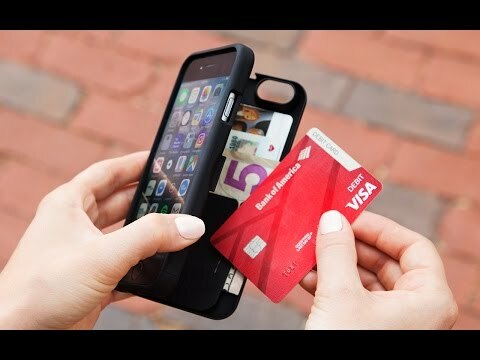 For those times you want to travel light, Linda Connolly created an iPhone case with secure storage for the essentials—ID, credit cards, and cash. There’s a wristlet strap for hands-free carrying and a built-in mirror to check your reflection.